For all those visiting Laos, Kuang Si Waterfalls is a must see natural wonder. Probably one of the most beautiful waterfalls in the world, Kuang Si Falls is a jaw-dropping sight. Its incredibly blue water together with the natural pools and round rocks create a unique scenery. If you are visiting Luang Prabang, you should definitely take half a day off to visit this waterfall. It’s easily accessible, close to the city and definitely worth your time! Seeing the Kuang Si Waterfall and visiting the Mandalao Elephant Sanctuary have been my two favorite experiences in Laos. Read more about the top 45 waterfalls in Asia here! When arriving at Kuang Si Falls, the first thing you will see is a large market with souvenirs and food. If you have the time, make sure to take a look – the locals sell beautiful handicrafts. After paying the entrance fee, make your way through the dense forest all the way up to the main waterfall. You will find incredible vegetation and along the way you can also pay a visit to the beautiful sun bears. Although I have mixed feelings about keeping any kind of wild animal into captivity, I think that the bears here have a better life than in the wilderness where they are continuously hunted and poached. After you’ve passed the bear sanctuary, you will have to walk a little more and you’ll reach the main waterfall. There is a bridge built right in front of the Kuang Si Waterfall from where you can admire the incredible view. Some of the natural pools are open for swimming. Make sure to bring your swimsuit with you and a towel. The water is quite cold year-round so if you only like swimming in hot water, maybe Kuang Si Falls is not for you. There are also a few jumping points but I would be careful about that. If everyone does it that doesn’t necessarily means that it’s safe. There is no way to be sure about how deep the water is so I would avoid jumping. Look out for other swimmers, including your mates! No diving! Jump with extreme caution! The entrance fee to the waterfall is 20,000 kip and the waterfall is open daily from 08:30 to 17:30. 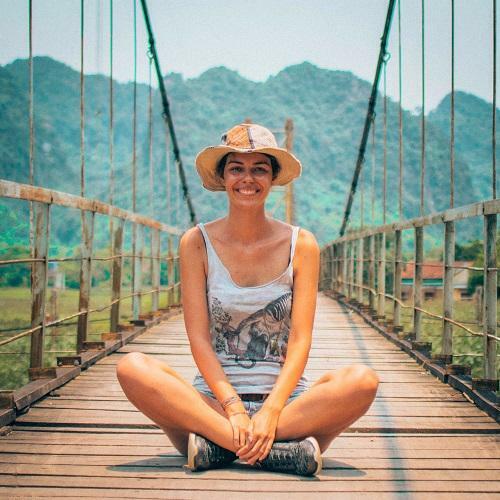 For other awesome things to do in Luang Prabang besides visiting the Mandalao Elephant Sanctuary, check out this article. There are many transport options to get to the Kuang Si Falls from Luang Prabang. Depending on how much time you have and your budget, you can choose one of the transport options below. Going to Kuang Si Falls by shared Tuk Tuk is one of the cheapest options available. A tuk tuk looks like a pick up truck but with benches in the back. Usually, it can accommodate up to 10 people. You will see tuk tuks all around Luang Prabang and you will only have to go to the driver and ask him if he takes trips to the waterfall. If you are choosing to go with a shared tuk tuk, you will most probably have to wait a bit until the tuk tuk is full in order to depart. If you’re not in a hurry, this shouldn’t be a problem. However, if you want to have full control over your trip to the waterfall, I suggest taking a private tuk tuk. Tip: the fare will most probably include a round trip to the waterfall but make sure to ask beforehand. Also, check the return hour. As a group, you will have to decide at what hour you should return back to the city. If you are a group of friends or simply want to run your own schedule, you should definitely choose a private tuk tuk. If you don’t want to search for a tuk tuk by yourself, you can ask at your hotel’s reception. Most hotels have their own trustworthy tuk tuk drivers and they can help you with booking one. Before booking a tuk tuk through your hotel, make sure to ask for the price. The advantage of booking a private tuk tuk to Kuang Si Falls is that you can manage your schedule the way you want. Tip: if you have back problems, I don’t recommend taking the tuk tuk. The road to the waterfall is pretty bumpy and the tuk tuk only makes it worse. Both affordable and comfortable, the minivan is a great way to get to the waterfall. The only disadvantage is that the departure and arrival hours are already set by the tour agency. You can find many agencies around the citiy where you can book your minivan trip to the Kuang Si Falls but most of them are located on the Sisavangvong Road. We personally chose this option because it was hustle free and cheap. I will start by saying that although going to Kuang Si Falls by motorbike is do-able, I don’t actually recommend it. The first reason is that Laos is well know for its motorbike scams. Actually there are scams at every step, but more about this in this article. Giving the fact that a shared tuk tuk or a minivan are cheaper alternatives, I wouldn’t risk any kind of motorbike scam. Also, as I’ve mentioned before, to road to the waterfall is in a pretty bad condition. If you’re a beginner at driving motorbikes, I wouldn’t risk it. Locals are driving chaotically and trust me, accidents do happen. If you’re looking for a private car with a driver to get to the waterfall, I recommend asking at your hotel’s reception. They might be able to help. Renting a car is convenient because you can manage your schedule and its comfortable at the same time. If you are a bigger group, it can also be affordable. Are you feeling adventurous? Well, get ready to bike for around 60 kilometers both ways on a hilly road. You’ll definitely need a good, sturdy bike for this trip so make sure to rent one from a trustworthy place. Biking to Kuang Si Falls is only for those in a great shape. Probably the most unusual way to get to Kuang Si Falls from Luang Prabang is by boat, down the Mekong River. The one hour boat ride will take you through the mountains and jungle while showing you some incredible scenery. It’s a great way to discover the local life of people living in this area. The boat will take you close to the waterfall but you will still need to take a pick up truck to actually reach Kuang Si (all is included in the tour). These are the tours I recommend if you choose to go to the waterfall by boat: Banana Boat Laos and Laos Adventures. Next Post Mandalao Elephant Sanctuary REVIEW – Is it ethical?